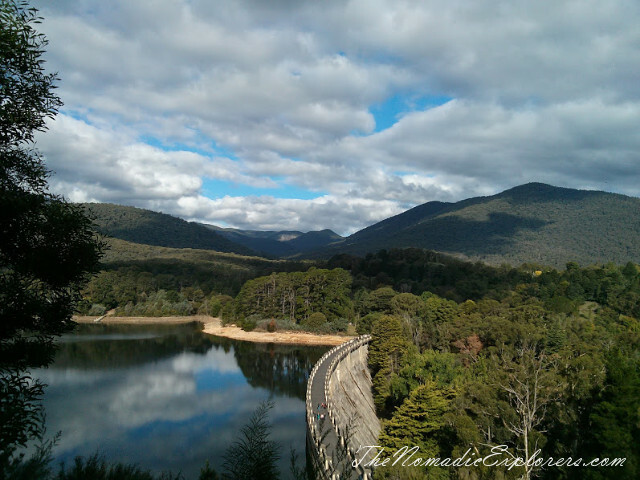 Maroondah Reservoir Park (or Maroondah Dam as it’s more commonly known) is located not far away from Healsville Sanctuary zoo. It is part of the water catchment area for Melbourne's water supply. The piped water supply commenced operation in 1857, with the completion of the Yan Yean Reservoir, adjacent to the Plenty River. In 1927 the Maroondah Dam was completed. Like most of Melbourne's water storages, the entire catchment is eucalypt forest completely closed to human activity, as is the reservoir itself. Immediately below the dam wall, the Maroondah Reservoir Park features a large garden landscaped in an "English style", featuring many exotic plants very different from the surrounding native vegetation. The car park is situated at the base of the dam wall and from there it’s a surprisingly short walk to the top. From the wall you can enjoy the magnificent panoramic views across the dam and look back over the walls edge to the gardens below. This area is a fantastic place to explore with all the family. We usually go this park to feed parrots after visiting Healsville Sanctuary. You can buy some seeds for parrots in your local store and enjoy. Last time lorikeets were sitting on our hands while we were feeding them! I took a lot of photos and everyone was happy.